STANFORD, Calif. - Stanford's Knowles Family Director of Men’s Golf Conrad Ray announced recently that David Snyder and Henry Shimp each signed a National Letter of Intent to continue their athletic and academic careers at Stanford. Snyder and Shimp will join the Cardinal roster in the fall of 2016. “We are very excited to welcome David and Henry to the Stanford family,” said Ray. “Both signees epitomize the highest combination of golf performance and academics in the country. “David is the first Texan we have had on the roster in quite some time and brings with him a strong world ranking and amateur playing experience. He is a dynamic student-athlete and interested in many things, and he will be a great addition to our team. Snyder, who hails from McAllen, Texas, is a three-time Future Collegians World Tour Player of the Year. He was a quarterfinalist at the 2013 Western Amateur and 2014 Australian Amateur. Snyder medaled in four USGA qualifiers and was a first alternate for the 2013 U.S. Open. Snyder was homeschooled and is an accomplished pianist. Shimp comes to The Farm from Charlotte, North Carolina, where he was an all-state performer in 2014 and the 2015 Charlotte Area Player of the Year. He led Myers Park (N.C.) to a trio of top-three state tournament finishes. The three-time all-conference player was a 2015 AJGA HP Scholastic All-American and a two-time Carolinas Junior Champion. The 2016 recruit from McAllen, Texas, is ranked 19th among Brentley Romine's list of top boys in the Class of 2016. He chose the Cardinal over Arizona State and Texas. "I was honored to have the opportunity to even go there and I couldn’t see myself not accepting that opportunity," Snyder told Golfweek. "Coach (Conrad) Ray is awesome, I visited multiple times and I couldn’t find a reason not to go." Snyder recently advanced to the Round of 64 at the U.S. Junior Amateur before losing to Texas commit Cole Hammer. 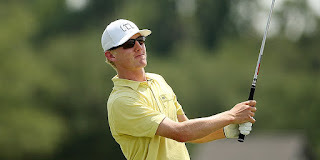 He is scheduled to play the Porter Cup, Western Amateur, Canadian Amateur and the U.S. Amateur this summer. Myers Park junior Henry Shimp is the Charlotte Observer golfer of the year, after putting together a banner year for himself. Shimp started his banner year winning the Mecklenburg County Invitational at Pine Island Country Club shooting a 68, the only player in the 74-player field to shoot under par. Next, Shimp shot a school-record 29 on the front nine at Myers Park Country Club in a home match with Charlotte Catholic, recording five birdies and an eagle. Shimp also excelled in the postseason, finishing as 4A West Regional champion and tied for 9th at the 4A state meet. He also played in the U.S. Amateur Four-Ball Championships at Olympic Club in San Francisco last month (May). 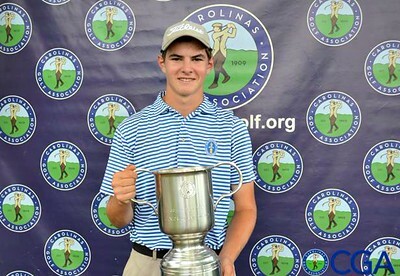 Shimp, who boasts a 4.9375 grade-point average in the classroom, says he expects to choose where he will play college golf later this summer from a list that includes Duke, North Carolina, Stanford, Wake Forest and Virginia.